Royal Air Force Sqn. Ldr. Andrew Edgell, test pilot at the F-35 Pax River Integrated Test Force, performs a ski jump Aug. 13, 2018, at NAS Patuxent River with an F-35B test jet as part of the workups to prepare for First of Class Flight Trials (Fixed Wing) aboard HMS Queen Elizabeth. Around 200 supporting staff from the ITF, including pilots, engineers, maintainers and data analysts, will take two F-35Bs test aircraft aboard the Royal Navy’s newest aircraft carrier this fall and are expected to conduct 500 take offs and landings during their test period at sea. This fixed wing test period brings the U.K. one step closer to carrier strike capabilities. After years of partnership within the F-35 Lightning II Joint Program Office, U.S. and United Kingdom team members from the F-35 Pax River Integrated Test Force eagerly anticipate the First of Class Flight Trials onboard the U.K.’s newest aircraft carrier, HMS Queen Elizabeth, this fall. When the first two fifth-generation F-35Bs – piloted by the ITF’s Royal Navy Cmdr. Nathan Gray and Royal Air Force Sqn. Ldr. Andrew Edgell – touch down on the carrier’s deck, the historic moment will be a tremendous step in bringing back Britain’s ability to launch fast jets at sea after a nearly 10-year hiatus. HMS Queen Elizabeth is the first of a new class of aircraft carriers that are the biggest and most powerful ships ever constructed for the Royal Navy. It features a flight deck designed exclusively to handle the F-35B, the short take-off and vertical landing variant of the fifth generation aircraft. The FOCFTs will also mark the first time the Pax River ITF has conducted F-35 flight trials aboard a partner nation’s aircraft carrier, and as the event approaches, ITF program leaders sat down to reflect on the evolution of the F-35 program, the dedication of its hard-working team members, and the cooperative partnership between the U.S. and U.K.
Andrew Maack joined the F-35 program back in 1996 and has been the Pax River ITF Chief Test Engineer and Site Director since 2002. The F-35 program has played such an important part in Maack’s career, that when being interviewed about the years-long effort to bring the aircraft to fruition, there was an emotional catch in his voice as he described the myriad personnel who made it all happen. “The people in this organization who did all this work were some of the most incredible people I’ve ever met,” he said. 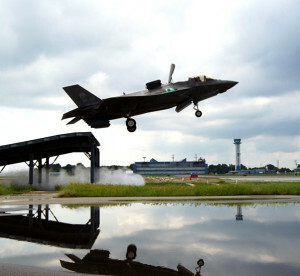 Maack referred to a time when the program was put on probation by the Secretary of Defense in 2011, when the F-35B variant was not performing as expected. Maack describes bursting with pride at the first landing of an F-35B on the L-class ship USS Wasp off the coast of Virginia in October 2011 but, surprisingly, he was not onboard to witness the milestone. “It’s really exciting when an airplane is at sea, and I wanted our incredibly talented Air Vehicle Department head at the time, Tom Briggs, now Chief Test Engineer at Air Test and Evaluation Squadron (VX) 23, to be out there instead,” he explained. But the ship was close enough to shore to provide a good telemetry lock which allowed Maack and the ITF team back at Pax River to witness the landing unfold via live feed. Now Maack can look forward to carrying that seaborne capability onto the deck of the Queen Elizabeth. Royal Navy Lt. Cmdr. Dale Collins, senior engineer managing the U.K. engineers working in the ITF hangar at Pax River, has been with the program just over three years. His fixed wing engineering and test background earned him the position with the ITF where his primary focus is as the U.K. integration lead, serving as a conduit for information coming from and returning to the U.K. about the ship. Peter Wilson, BAE test pilot at the F-35 Pax River Integrated Test Force, performs a vertical landing Aug. 15, 2018, at NAS Patuxent River with an F-35B test jet as part of the workups to prepare for First of Class Flight Trials (Fixed Wing) aboard HMS Queen Elizabeth. Around 200 supporting staff from the ITF, including pilots, engineers, maintainers and data analysts, will take two F-35Bs test aircraft aboard the Royal Navy’s newest aircraft carrier this fall and are expected to conduct 500 take offs and landings during their test period at sea. This fixed wing test period brings the U.K. one step closer to carrier strike capabilities. As a Tier 1 high level cooperative partner, the U.K. has been involved with the F-35 program from the start. The Tier 1 designation also highlights the two countries’ close relationship going forward. “From an operations perspective, because of the type of aircraft we’ve chosen [the F-35B], our relationship with the U.S. Marine Corps will be very strong, especially for the next 25 years or so,” Collins added. 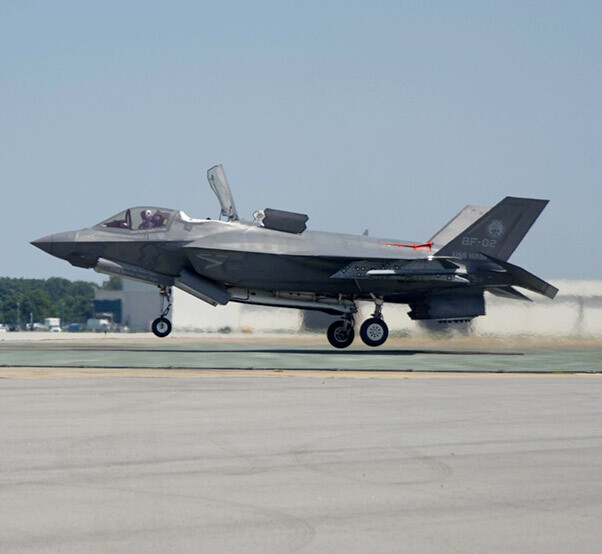 The USMC has been operating with the F-35B since July 2015 and currently has four squadrons operating the STOVL variant. They also have two deployments with the fifth generation fighter under their belt. “There are going to be unique operations we’ll be doing out there; it’s going to be exciting testing,” Maack said about the upcoming FOCFTs. Queen Elizabeth’s flight deck differs from U.S. L-class ships, which are amphibious warfare ships with small flight decks. The uniqueness of the ski jump launch, Maack said, is that it enables the airplane to get more gross weight, more payload, more weapons and more fuel airborne off the bow of a ship. Going forward, a small U.K. team will remain embedded within the ITF after the FOCFTs. “The U.K. aims to keep a small team within developmental test, within the ITF at both Pax River and Edwards AFB, as we have now. We’ll also keep an operational test team at Edwards that will do operational tests with other counties involved with the program,” Crockatt said. With operational testing due to begin shortly, the ITF team is expecting additional workload to come their way as a result. While Maack and Crockatt will be onboard the Queen Elizabeth for the upcoming trials, Collins retires in August and will have to observe from afar. Right now, the goal is to get both F-35Bs to the Queen Elizabeth, get them safely back, and collect a lot of data in between. Crockatt said he looks forward to the data the ITF has, and continues to collect, being used to help the U.K. declare initial operating capability (maritime) for the U.K. F-35B Lightings, followed by the return of carrier strike cability for the UK in 2020. “From there on, the UK F-35B Lightings can partake in supporting the defense of our realm, or whatever tasks our government decides for us to participate in,” he said.